Weighing in on the Lebron James spectacle. I support Lebron. I think he did the right thing. He did what Kevin Garnett should have done 7 years into his career. Sometimes you can have all the right chess pieces, on paper, but for whatever reason they do not gel at the right time. Lebron is so polarizing because he’s so good, on par with the abilities of Jordan or Bryant. I think he’s pushing the concept of an individual being a brand, before teammate, more than previous players. But the NBA is evolving, just like all other enterprises. I’m more progressive with most of my views, so Lebron having this press conference, is all part of the spectacle. Provided by “Enterainment Sports Network.” Not NPR’s sports division. This is what people need to realize first and foremost. Sure it was a little hacky, with the kids sitting in the background, and Jim Gray trying to bring some “professionalism” to this other wise circus act. Of course there was no need for it, just like there was no need for the Tiger Woods press conference. But it whets our collective appetite for something “new”, something different from the ho-hum reuters headline of where the next free agent would sign. It’s novelty. Novelty runs the media, sports, and hollywood. Again Lebron is playing the NBA’s party line of “win, win, win”. Every player should constantly declare the need to win a championship, or more championships. Million dollar contracts are simply not to be discussed, as thousands continue to lose jobs and not receive unemployment benefits. Stern must constantly urge GM’s to tell their players to tow the party line of rah rah, win, win, win sportsmanship. It may have the affect of inspiring the masses to overcome their own personal difficulties in life and come out on top. A David and Goliath script that can hardly ever go wrong, along with solid TV ratings. Ok enough haphazard philosophy on sport. 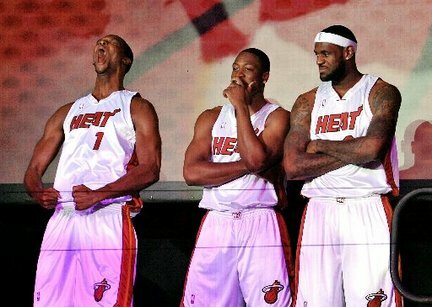 Lebron signing with D. Wade and C. Bosh or “6,3,1” is great for the NBA. It gives new fans a reason to tune into TNT and listen to Charles Barkley say how “this will not work, its trrble.” And Kenny Smith disagreeing, and finally Ernie butting in pointing out the amazing stats these 3 have compiled over their careers. I look forward to this development, as I’ve been a fan of the NBA since I was a kid. I think the matchup with the Celtics will be great, as aged veterans give their all against the up and comers. You heard it here first. “6,3, 1 vs. The Big Three.” Old vs. New and whatever catchy headlines ESPN can churn out in anticipation for these games.